AEMC Instruments introduced its high capacity fused test leads, rated up to 1000V, CAT IV in accordance with IEC/EN 61010-031. 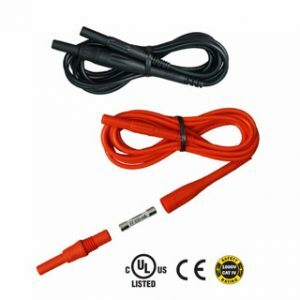 These red/black fused test leads allow for the use of standard 4mm safety probes and alligator clips providing a fuse-protected measurement of any electrical device. The insulation on these leads allows them to remain pliable even in colder temperatures. To replace the fuse in either lead, the two part fuse connector can be easily unscrewed. The safety rating of the leads is dependent on the fuse rating.